Unlike most coastal locations in the UK, Brighton is a vibrant and modern city and one that boasts some great places to eat. The stacks of new burger joints, trendy Italian pizzerias, and burrito bars are a refreshing change from your bog standard seaside fish and chips. We headed down to the sea for a late lunch and sampled one of the best local burgers at Burger Brothers. 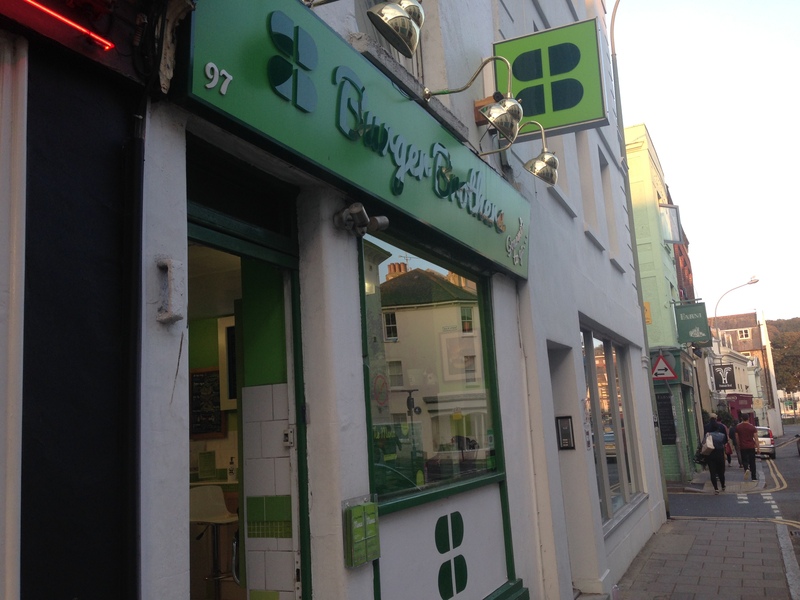 The Joint: Burger Brothers, 97 North Road, Brighton, BN1 1YE. Check out their Facebook profile here. The Vibe: Opened by Nadz and Pip in April 2013, Burger Brothers are quietly carving out a name for themselves. Tucked away in a popular area of town is their small, we’re talking five bar style seats here, but nicely presented joint. The owners greet us on arrival, as they do with everyone walking through the door, and their enthusiasm and commitment shines through. We quickly order a Simple Jack burger with added chorizo and settle down in the corner. Usually we’d launch into a description of the food here but during our eight minute wait we spot something special. There’s a steady stream of hungry punters through the door but each are treated like they’re truly making a difference. Choice is high in the area (and hey…we had headed to Brighton Burgers first but found a ‘Now Closed’ sign in our way) and Nadz and Pip radiate gratitude with each order. It’s an approach that’s served them well so far as their first year of trading saw a steady stream of ‘Sold Out’ signs whenever they were cooking up a batch. Great customer service can go a long way…but we’re here for the burger itself and that certainly didn’t disappoint. The Simple Jack is perhaps the least adventurous item on the menu but a good burger doesn’t have to be smashed full of toppings to make a statement. Its success is in the taste and texture and the Simple Jack had a good mix of both. The patty is juicy and covered in melted Monterey jack cheese, and the added chorizo is thinly sliced and served with a touch of good old fashion tomato ketchup. It’s served in a generously sized seeded bun, perfect for soaking up the moisture. True to its name – it’s a simple burger and a real winner too. You can’t get fries at Burger Brothers but that helps keep the focus (and the calories down). 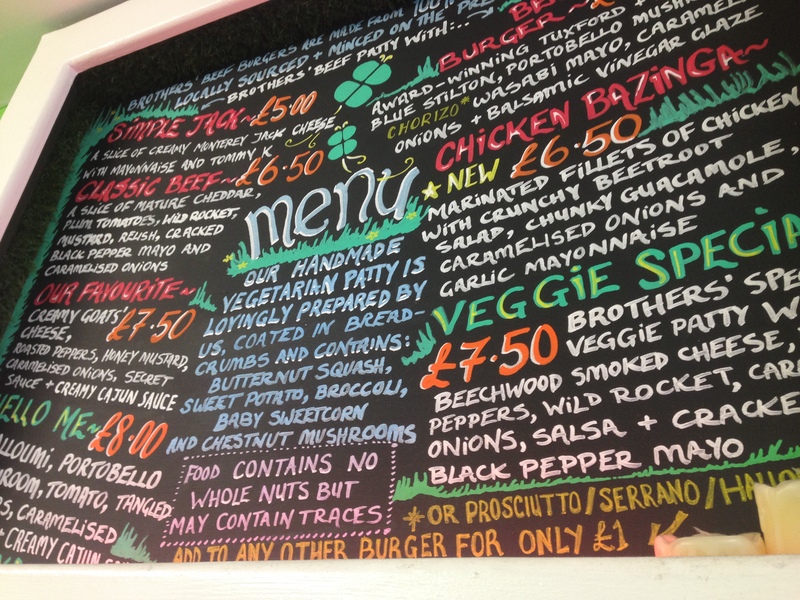 A trip to the seaside has always been a good excuse for fast food but step away from the pier and head to Burger Brothers. You’ll get great food with even better (if that’s possible) customer service. Good stuff. The Price: Between £5 and £10 for a burger, depending on how many toppings you wanted to cram in. The Simple Jack with added chorizo is a reasonable £6. Burger Brothers was visited by Tom in September 2014. Posted in BrightonTagged beef burger, brighton, Brighton Burgers, brighton north road, burger, burger brothers, Burgers, burritos, cheese, chorizo, coastal, eating out, lunch, seasideBookmark the permalink.